Jean Badin. Clare Crowhurst. 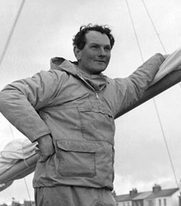 Donald Crowhurst. Simon Crowhurst. Santiago Franchessie. Ted Hynds. Donald Kerr. Robin Knox-johnston. Simon Russell Beale. Documentary. Sea/Rivers/Boats/etc. Madness and Mental Illness. 01 Nigel's Choice. Sport. 01 Kelly's Heroes. Rob Recommends. 1960s. Media/Journalism. Recommended. 01 Ade tastics. While the Americans were trying to reach the moon the economically and politically suffering British had found a new sort of hero, long distance yachters. The Sunday Times put up a prize for the person who could make the fastest non-stop solo circumnavigation of the globe, a feat thought beyond the endurance of man or machine and so it proved for all but one of the Kiplingesque adventurers who stepped into the breech. This remarkable documentary, from the team that brought us Touching The Void, explores the tragic fate that enveloped wannabe hero Donald Crowhurst and tries to make sense of his death. Was he a victim of circumstance or society? Was he simply carried along by a tide of fatal momentum? Or was he a loser who just dug himself a hole far too deep to get out of? . There is humour involved in proceedings, mainly stemming from an existential French sailor called Moitessier who didn't want to go home, and the sense of incredulity evoked by simply relating the chain of events is a source of grim laughter, but, as with all timeless tales of human tragedy, the gallows humour just makes the sorrow hit harder.